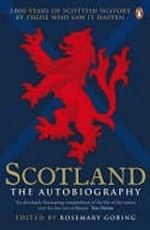 Аннотация к книге "Scotland: The Autobiography. 2, 000 Years of Scottish History by Those Who Saw it Happen"
A vivid, wide-ranging and engrossing account of Scotland`s history, composed of eye-witness accounts by those who experienced it first-hand. Contributors range from Tacitus, Mary Queen of Scots and Oliver Cromwell to Adam Smith, David Livingstone and Billy Connolly. These include key historic moments - ranging from Bannockburn and Flodden to the SNP parliamentary victory in 2007 - along with a vast array of wonderfully readable insights into the everyday life of Scotland through the millennia. This is living, accesible history told by crofters, criminals, servants, house-wives, poets, journalists, nurses, politicians, novelists, prisoners, comedians, sportsmen and many more.